** Please note that this is the first edition of the Marshmallow Marseille deck and not the current version that they currently came out with that has the foiled backs. As sweet as the name implies. This smooth, colourful and addictive creation can be enjoyed by the fire all year round. Inspired by an 18th century Tarot made in the town of Trieste in Italy, the Marshmallow Marseille is sprinkled with sweet magic to make all your readings burn bright. 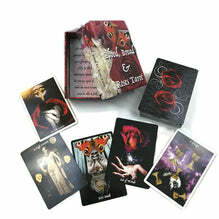 Marshmallow Marseille is a full 78-card, Poker-size Tarot deck printed on high quality 320 gsm card stock. Cards come in a lovingly designed tuck-box.